Our Easter Scavenger Hunt is a free event for kids up to age 12. Join us on Saturday, April 20th for a day of family fun. 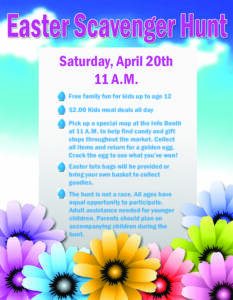 Kids will receive a scavenger map starting at 11 AM that helps them locate candy and prize stops throughout the market. Once they find all prizes on the hunt, they’ll return to the Information Booth to choose a golden egg – many of which have an additional, larger prize! Our snack shacks will have $2.00 kids’ meals all day long and the Easter bunny will be wandering the market for photo ops!